The title says it all, “The Schizophrenic World of Food and Body Image.” This blog post is personal and deeply important to me. Yesterday I was checking Facebook the way I always do, and as is usual, my feed was filled with the usual news, cats, Celine Dion and pictures of food. But it was also filled with a number of other things, including bullying/suicide, body shaming and stories of eating disorders. It dawned on me that we live in a really screwed up world that simultaneously is obsessed with food and cooking while also being fixated on what the media portrays as perfection when it comes to weight. And you know what? It’s wrong. All of it is broken. I have alluded before to having battled with eating disorders as a teenager/young adult and I have also discussed my rapid weight loss this year due to medical issues which are now under control. My personal experiences have certainly influenced my response to this topic greatly and I continue to evolve in terms of how I deal with it and approach the subject. Suffice it to say that we as a society have a screwed up perception of what is healthy. Yesterday when I came upon this photo I was appalled and disgusted. This image struck a chord with me as I am sure it does with many women who felt fat as kids. 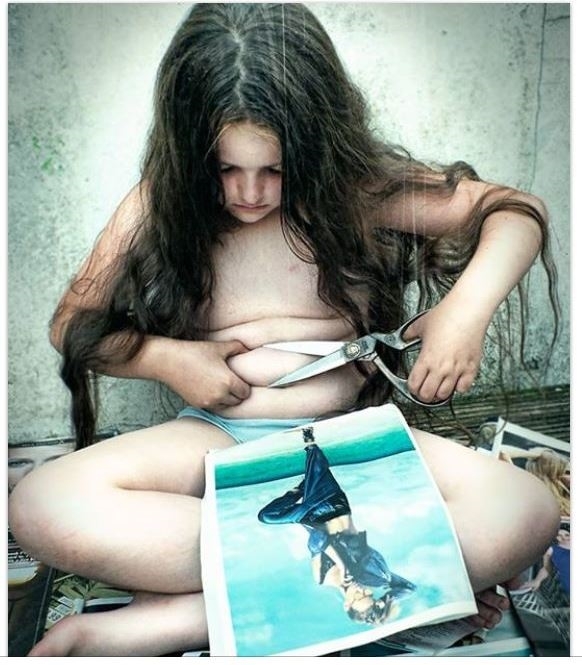 The extremity of it is just a glimpse of how detrimental this kind of mixed media and body shaming can be to a young mind. It was tough in a world before the internet and social media, which is when I grew up, but I cannot even fathom how tough it is for young kids now. It is a constant barrage of negative body image messages. Then later in the day I came upon the story of Lady Gaga and the ridiculous backlash she received from people on Instagram after posting this photo of herself with the caption: #bodyrevolution Proud at any size, because the inside is what really counts, Plus, it’s all how you pose!Just ask the supermodels! She was immediately bombarded with negative feedback and hateful comments calling her fat and gross. Really?? If this is what people perceive to be fat we have serious problems in this country. That’s the first part, the second part is, when did we decide it was EVER OK to body shame anyone, even if it is a celebrity who puts herself out there for people to see. Nobody deserves to be treated that way. We need to seriously reevaluate our perceptions and the way that we talk about our bodies. Quite frankly I’d be very happy to stop using the words “fat” or “skinny” and start talking about “healthy” which comes in all shapes and sizes. Food and our bodies are deeply personal things. We all have to eat and we shouldn’t be ashamed of it. We also shouldn’t feel like we are constantly being judged by others no matter what size we are. As somebody who is passionate about food and about teaching people how to cook healthy and delicious recipes, it deeply saddens me that this mission is sabotaged at every corner by the media. We have to come to a point where we decide that enough is enough. We have to all change our dialogue and build one another up, not tear each other down. Weight fluctuates. Men and women gain weight as they age. Weight comes off and on for all kinds of reasons, be they medical, emotional or otherwise. Nobody knows what anyone else is going through and therefore it is important that we focus on the positive. I will finish with one final image and that is of ballerina Misty Copeland. Misty, for those of you who don’t know her, is a soloist with the American Ballet Theater and unique because as a black woman she has overcome overwhelming obstacles to make it in a very white world. She was also told as a young woman that she didn’t have the right body for dance. She was too curvy and that would never fly in that world. Well, Misty defied the odds and is now a successful author, ballerina and recently has become one of the faces for the Under Armour campaign showing what athleticism really is. I have admired her for her talent and for her outspokenness about being comfortable with your body and who you are. I think we could all stand to learn from her example of self confidence and loving the body you are in.